Let's go back to last week...it seems like weeks ago, but really it was just last week. Connor had his christmas performance at school. Apparently it is a bit of a big deal. They started practicing two months ago. There were speaking parts, but there was a mix up and Connor thought he would have to make up what he was going to say, so didn't apply. But, as luck would have it, he put his name in the hat for the air guitar solo and was chosen. 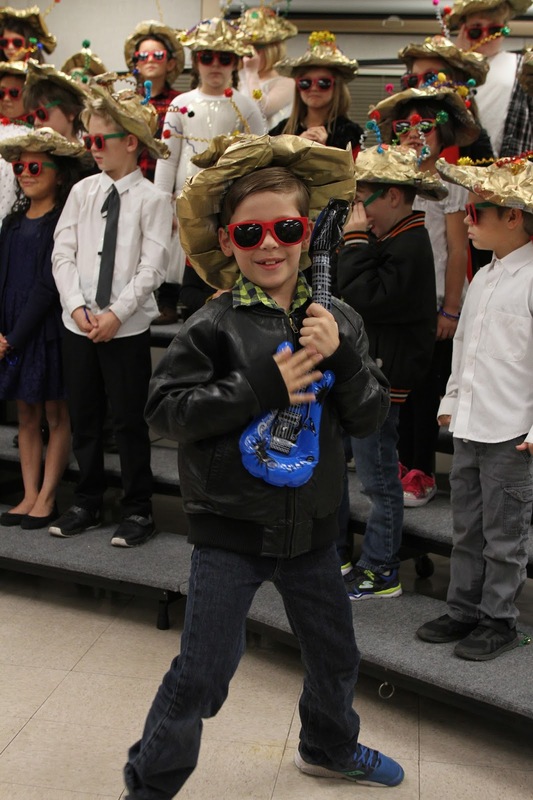 Connor really wanted a leather jacket for the performance so he could look like a rock star. I found one for him at a thrift store. That statement makes it sound like it was easy to find. I actually checked many a thrift stores and even target for something. It wasn't until a few days before the performance that I came across this one. He liked the jacket way more than I thought he would and has actually worn in a few times since the performance. At the performance, Connor was so incredibly serious through the whole thing. If you watch the video below, you will get what I am talking about. But when it was time for his air guitar solo, he went to town. It was really cute and fun. I am glad he got the chance to do it. Also, on a side note. The older the kids are getting, the less and less parents seem to bring big cameras to functions. I was the only person there with a camera. And it was a packed house. Plus I managed to score a front row seat, thanks to Isla who ran in and excitedly grabbed them. Anyway, I had a few parents ask (even ones texting me from farther back!) to take pictures of their kids during the performance...ha, ha! I may get made fun of in jest every once in a while for carrying around my beast of a camera, but it does come in handy. If you just want to watch the good stuff, fast forward to 51 seconds to see Connor's air guitar solo.